Rev. Theodore M. Hesburgh, C.S.C., president of the University of Notre Dame from 1952 to 1987, a priest of the Congregation of Holy Cross and one of the nation’s most influential figures in higher education, the Catholic Church and national and international affairs, died at 11:30 p.m. Thursday (Feb. 26) at Holy Cross House adjacent to the University. He was 97. 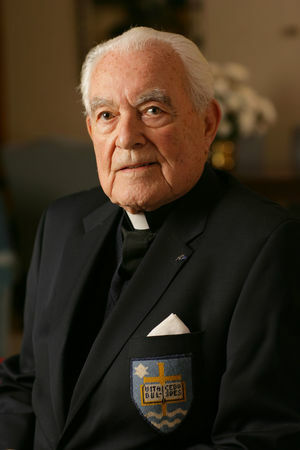 In accord with Father Hesburgh’s wishes, a customary Holy Cross funeral Mass will be celebrated in the Basilica of the Sacred Heart at Notre Dame in coming days for his family, Holy Cross religious, University Trustees, administrators and select advisory council members, faculty, staff and students. In lieu of flowers, contributions can be made to the Father Ted Hesburgh, C.S.C., Fund for Excellence in Catholic Education at Notre Dame or to the Congregation of Holy Cross. 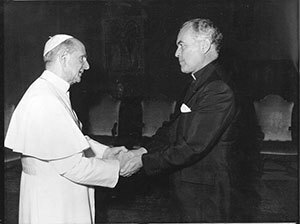 Father Hesburgh was born May 25, 1917, in Syracuse, New York, the son of Anne Murphy Hesburgh and Theodore Bernard Hesburgh, an executive of the Pittsburgh Plate Glass Co. A brother, James, was graduated from Notre Dame in 1955 and lives in South Bend, Indiana. Three sisters preceded him in death. Justice was the focus of many of his outside involvements. He was a charter member of the U.S. Commission on Civil Rights, created in 1957, and he chaired the commission from 1969 to 1972, when President Richard Nixon replaced him as chairman because of his criticism of the administration’s civil rights record. 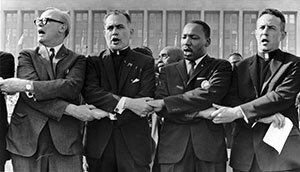 Father Hesburgh was a member of President Gerald Ford’s Presidential Clemency Board, charged with deciding the fate of various groups of Vietnam offenders. His work on these commissions led to the creation at Notre Dame Law School of the Center for Civil and Human Rights. In 1971 he joined the board of the Overseas Development Council, a private organization supporting interests of the underdeveloped world, and chaired it until 1982. During this time, he led fundraising efforts that averted mass starvation in Cambodia in 1979-80. Between 1979 and 1981 he also chaired the Select Commission on Immigration and Refugee Policy, the recommendations of which became the basis of Congressional reform legislation five years later. He was involved during the 1980s in a private initiative that sought to unite internationally known scientists and world religious leaders in condemning nuclear weapons. He helped organize a 1982 meeting in Vatican City of 58 world-class scientists, from East as well as West, who called for the elimination of nuclear weapons and subsequently brought together in Vienna leaders of six faith traditions who endorsed the view of these scientists. His global perspective was the impetus for the establishment at Notre Dame of the Kellogg Institute for International Studies and the Kroc Institute for International Peace Studies. When Father Hesburgh stepped down as Notre Dame’s leader June 1, 1987, it ended the longest tenure at that time among active presidents of American colleges and universities. After a yearlong sabbatical, he returned to a retirement office on the 13th floor of the newly named Hesburgh Library. One of his first projects was completion of an autobiography, “God, Country, Notre Dame,” which was published in November 1990 by Doubleday and became a national best-seller. In addition to his biography, Father Hesburgh wrote three other books — “The Humane Imperative: A Challenge for the Year 2000,” published in 1974 by the Yale University Press; “The Hesburgh Papers: Higher Values in Higher Education,” published in 1979 by Andrews McMeel Inc.; and “Travels with Ted and Ned,” published in 1992 by Doubleday. Originally published by Dennis Brown at news.nd.edu on February 27, 2015.